ONCE is the only producer. 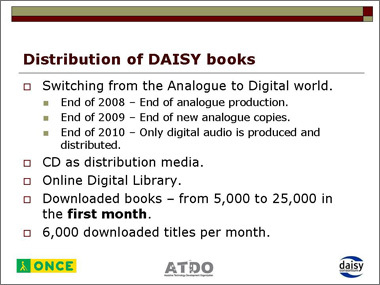 20,000 digital audio titles - 60% with DAISY structure. Analogue production was discontinued in 2008. Full preference to educational materials (100% of requests are filled). Audio-only books are a dead-end type of book. One input file - multiple output formats. Switching from the Analogue to Digital world. End of 2008 - End of analogue production. End of 2009 - End of new analogue copies. End of 2010 - Only digital audio is produced and distributed. Downloaded books - from 5,000 to 25,000 in the first month. 6,000 downloaded titles per month. 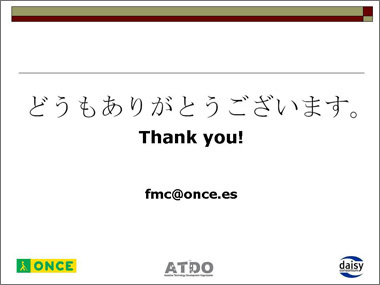 Online distribution is a great success. Code Factory (friend of the DAISY Consortium). 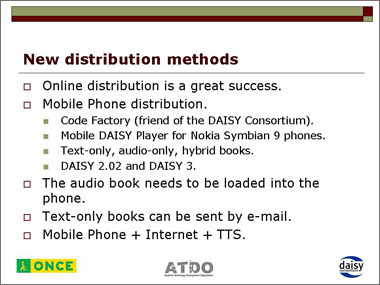 Mobile DAISY Player for Nokia Symbian 9 phones. DAISY 2.02 and DAISY 3. The audio book needs to be loaded into the phone. Text-only books can be sent by e-mail. Mobile Phone + Internet + TTS. 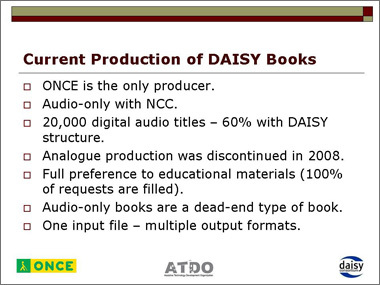 ONCE produces 1,000 new audio DAISY titles every year. 1,400 titles from our archives are given DAISY structure every year. All these, together with our Braille production is only 4% of all published books in Spain in 2008. Specific books, produced in specific formats, by a specific organization, for specific users. New copyright law - exception for all disabilities. From “specific formats” to formats that adapt to the user’s needs. 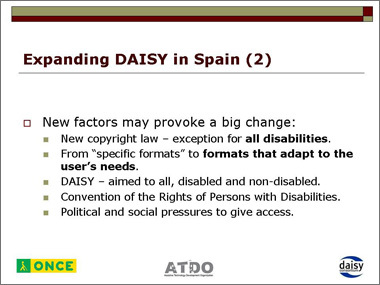 DAISY -aimed to all, disabled and non-disabled. Convention of the Rights of Persons with Disabilities. Political and social pressures to give access. Promote DAISY production outside our organization. 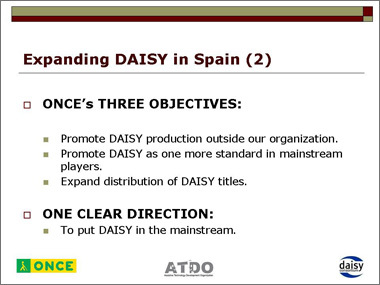 Promote DAISY as one more standard in mainstream players. 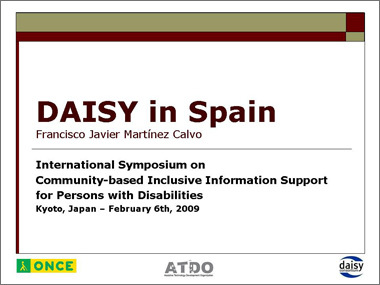 Expand distribution of DAISY titles. To put DAISY in the mainstream. DAISY books in every library. DAISY books in every bookshop. 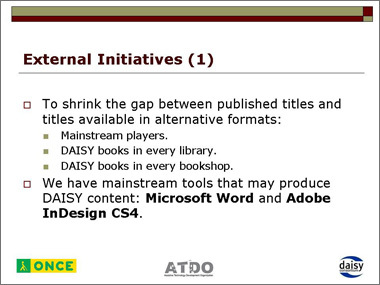 We have mainstream tools that may produce DAISY content: Microsoft Word and Adobe InDesign CS4. Open University of Catalonia - accessible online content for everyone. Udima - Private Open University in Madrid. Interest from the Public Libraries Network. We shouldn’t be doing it all ourselves.